1301PE is pleased to announce its fifth solo exhibition of new work by Los Angeles-based artist Pae White. 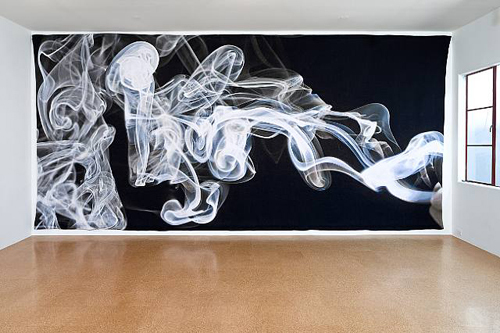 In this show, White will be exhibiting a group of "smoke tapestries" along with a set of "smoke drawings". White deftly incorporates modern digital technology with the old-world craft of woven tapestry. The title Smoke Knows references the knowledge of the artwork's making to the subject itself, in this case smoke. Images of smoke are freeze-framed, in the form of traditional tapestries produced in Belgium. Production questions, such as "how-to-weave smoke? ", become the secrets of the artwork. White will also be exhibiting a series of works on paper. What first appear to be drawings or prints of smoke are actually carvings of paper, produced through a removal of the thin layer of paint on Color-Aid paper in a process similar to micro-dermabrasion, but in this case generated with a laser. More mysteries come to light as a decommissioned fireplace is uncovered in the walls of the gallery, exposing its secret past as a Lanz showroom. 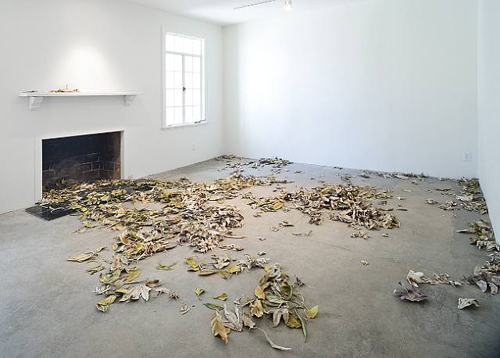 Within this fireplace will be a pile of handcrafted "gutter leaves" directly referencing those found in the gutters of Pasadena during the winter, which is precisely when and where White and her sisters would wear Lanz nightgowns when she was growing up (the place Pasadena, not the gutter). From a distance the work appears to be a clear print or even a photograph, but upon closer examination the image starts to disintegrate and becomes pixilated. Pae White is one of the most significant American female artists participating in the international dialog on design today. 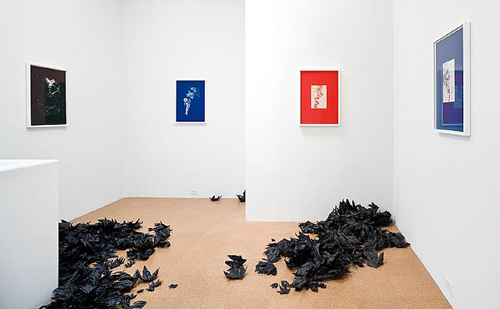 From her delicate mobile aviaries, brightly colored Plexiglas "pools," hanging tapestries, glass "rivers" to her numerous catalogues, advertisements and magazine covers, her work is crisp and challenging. White's work utilizes the language of advertising, arts & crafts, fine arts and graphic design. In employing these locales and disciplines, White brings together these seeming disparate worlds, challenging the possibilities of visual arts. Pae White was born in Pasadena, California. She graduated in 1985 from Scripps College, Claremont and received her MFA from Art Center College of Design, Pasadena in 1991. White has exhibited internationally at institutions such as at SMOCA, Scottsdale, Arizona, Contemporary Arts Center, Cincinnati, Ohio, UCLA Hammer Museum, Los Angeles, Hirshhorn Museum and Sculpture Garden, Washington DC. White was a featured artist in the Sculpture Projekte Munster, 2007. Pae White will also be participating in the 53rd International Art Exhibition at the Venice Biennale 2009.